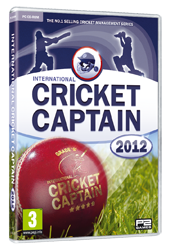 International Cricket Captain is back for 2013, with the most realistic game engine ever seen in a cricket game, new game modes, features and statistics. Everything is set for an action packed season of international and domestic cricket, which sees Australia and England battle it out in home and away test series. Whichever form of cricket you enjoy, from test to twenty over, Cricket Captain simulates every nuance to perfection putting you in complete control. "All-time greats" series: ever wondered how Bradman would have fared against Botham? Play a custom-made international series using all-time-great players. Classic England vs. Australia scenarios: play one of five classic test series. International on-line: by popular demand, you will now be able to play international test, ODI and T20 matches over the internet, including improved detection of edited teams in all on-line modes. Improved close fielding engine and field-settings: adjustments to the game engine to produce greater realism in close catching and run-scoring. Choose which teams you want to captain: twenty over, one-day, first-class (or all three) for domestic and international competitions. Improvements to international series game modes: select home or away series; option to pick the opposition team (allowing you to replay series as they happened). Squads: separate test, ODI and twenty over squads for international fixtures. Statistics: Separate player statistics for each domestic competition. Fixtures: Comprehensive domestic and international fixture lists. 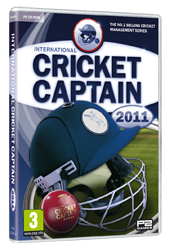 International Cricket Captain is back for 2012, packed with new leagues and features. For the first time you can compete in the star studded Indian and Australian twenty over leagues, as well as in the new format English domestic season. Incredible attention to detail has been given to the comprehensive database of international players, and enhancements to the match engine and AI give even greater realism. Now with international series statistics for players, current season records for all teams, and the ability to save the profiles of your favourite retired players, this is the most comprehensive version yet of the number one selling cricket management game. New Indian twenty over league. New format Australian and English twenty over leagues. Complete English and Australian domestic systems. Updated team kits for all domestic and international teams. Improved on-line experience with enhanced cheat detection systems. New player types, including one-day and twenty over specific openers. Save to the cloud from your PC and pick up where you left off on another machine. Play on-line with all domestic teams against iPhone and Mac users. Series statistic for all international teams. Complete player database of over 4000 players. Up to date domestic squads. Full schedule of world cup fixtures, plus stand alone modes. International Cricket Captain returns for an action packed 2011 season, which sees England, India and South Africa battle it out for world number one status, while Australia re-build with an exciting crop of young players. Including new game-play features and a comprehensive statistical update, you have complete control of every tactical nuance. Pick your favourite side from the international, English county or Australian domestic systems and captain them to glory. Win the international leagues, world cups and domestic trophies and break records across all three formats of our beautiful game. Save to the cloud from your PC and pick up where you left off on another computer or on the 2011 iPhone version. New twenty-over international championship and player ratings give you more silverware to play for in your quest for creating the number one side in world cricket. Improved one-day match engine and refined player ability generation provide an even more realistic cricket experience. New custom field setting mode allows you to re-define every field in the game and quickly switch between them when you change your bowler or tactics. Improved on-line lobby allows players to challenge you while you play a single player game. On-line match-play between PC, iPhone and Mac users. New screen-size options allow you to enjoy match play in full widescreen and make the game compatible with Netbooks. All resolutions are also available in windowed mode. Full schedule of one-day and twenty-over world cup fixtures, plus stand-alone world-cup game modes. Play on-line with your English or Australian domestic team. Updated team kits for international and state sides. One day and twenty-over records for partnerships and best performances. Complete player database of over 3000 players, containing every player currently playing first class or limited-over cricket from around the world. Up to date county and state squads for the new seasons. Comprehensive domestic and international fixture lists. Improved player abilities to provide even greater realism. Accurate and up-to date rules. The most realistic cricket management simulator ever made has been re-worked, with an improved one-day match engine, and refined player ability generation for an even more addictive experience. Feel the exhilaration of the winning the World Cup final in the last over after needing 10 to win with only one wicket in hand. Build a world class county or state side by signing top players and nurturing youth. International Cricket Captain is back for the fascinatingly poised 2010 season. With up to date competitions, greater realism, and packed with features and stats, Cricket Captain 2010 will once again raise the bar in cricket management gaming. Take control of your favourite side from the English County, International or Australian Domestic system. You control your team's fortunes. Have you got what it takes to be a world champion? Full schedule of limited overs and 20 over world cup fixtures, including the 20 over world cup game mode. New Australian domestic cricket circuit, including first class, one day and 20 over competitions. New English cricket competitions, including the 20 over league packed with overseas stars. More aggressive and challenging match engine captures the modern game to perfection. Sign reserve overseas players and specialist 20 over players. Improved vice-captain when skipping matches. Complete database of every current first class, list-A limited overs and twenty over player from around the world (over 3000 players). New sort and search database interface, including career strike rates for batsmen. Accurate batsmen aggression ratings and improved player rating system. 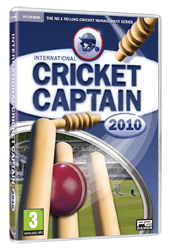 International Cricket Captain 2010 is the most detailed, accurate and exhilarating version yet of the number one cricket management simulator. We’re very excited to bring you a game which not only builds on the iconic series, but takes it to a new level. Can you succeed in the most realistic English domestic season yet, while taking your favourite national side to be top of the test championship? You can also try your hand in the most competitive domestic circuit in the world in the brand new Australian domestic season.